Imagine if world leaders travelled back in time, about a hundred years. Imagine Merkel’s Germany waging a war against Macron’s France, with thousands dying in muddy trenches across Europe daily. Not easy, right? Europe has come a long way since then. Imagine, then, Donald Trump in the White House, looking at the war raging across the Atlantic, weighing the pros and cons, deciding to put an end to the Monroe doctrine (of not meddling in European affairs) and, finally, sending his boys to die in combat in Europe. Again, not easy. Trump would not have acted as Woodrow Wilson did. Indeed, the centennial Armistice event in France at the weekend (10-11 November), provided a brief summary of a lot that’s not right with today’s Europe. And, indeed, the world. For starters, President Trump landed in Paris and immediately tweeted against the insolence of his host, French President Emmanuel Macron, who had said that Europe needed a true European army to defend itself against Russia, China…and the US. Not a great start, and it only went downward from there. Next, Trump cancelled his attendance, at the last minute, at a ceremony at the Aisne-Marne cemetery (some 50 km from Paris) on Saturday, where at least 2,000 US soldiers killed in the Great War are buried. The White House said it was because of the rain, which “made logistics of transport difficult”. It remains unknown whether this was due to his concern for his hairdo, bad mood or sheer disrespect. 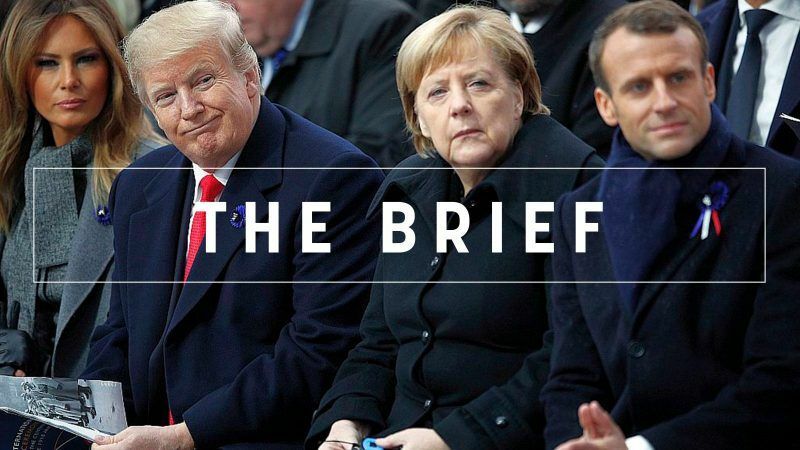 What we do know is that it drew strong criticism from all sides, but at least it allowed Merkel and Macron to put on a show of unity as they lay wreaths. A historic flashback. The wreath ceremony was a rare public display of emotion, where Merkel put her head on Macron’s shoulder and they briefly held hands. This was certainly reminiscent of the iconic holding of hands of Helmut Kohl and François Mitterrand. But this time the Chancellor looked frail and tired and, instead of projecting the image of strength and unity, the scene looked more like a farewell of an old ruler, accompanied by his eager successor. On Sunday, Trump beamed at the arrival of Russia’s Vladimir Putin to the main ceremony, while all the other leaders seemed a bit embarrassed. To leave no room for doubt, Vlad gave him the thumbs-up. As if praising Trump for being successful in his mission, whatever it is. Another historic flashback: A strong leader of Russia and a weak US president. That was in Yalta from 4 to 11 February 1945. Franklin Delano Roosevelt was very sick and died a month later. Unsurprisingly, the Yalta deal was eventually too good for Stalin. Meanwhile, the smaller countries squabbled about seating arrangements for the Sunday lunch. In particular, Serbian President Aleksandar Vučić was deeply unsettled by the fact that his political foe, Kosovo President Hashim Thaçi, got a more prominent seat and Serbian newspapers screamed about “the shame in Paris”. Few seem to realise that tomorrow’s history will be written from today’s episodes of littleness. Under grey skies and gently falling rain, Europe gave its tribute to the millions of soldiers killed in World War One. On the sidelines of the commemorations, EU’s Donald Tusk lashed out against US President Trump, accusing him of being averse to a “strong and united” Europe while warning against the emergence of a “brownshirt” nationalist front in EU elections next year. Germany’s Angela Merkel and France’s Emmanuel Macron also defended multilateralism as Trump avoided making an appearance at the Paris Peace Forum. Macron, meanwhile, has been keen to present himself both as a French patriot and a pro-European. People all around the world sent their greetings to Poland this weekend for the country’s celebrations of its centenary of independence. However, the festivities also showed that it is still a divided country. The European election front, the EU’s social democrats, leftist politicians and ecologists urge the need for a common strategy to halt the rise of far-right populism in Europe. Meanwhile, EURACTIV takes a closer look in a short video at the EPP’s new old face who is the party’s Spitzenkandidat pick. A anti-agreement front is growing: Six EU countries – and counting – plan to back out from the global UN migration pact which is meant to be signed in December. In a big bang just weeks ahead of Romania’s take over of the EU’s six-month rotating presidency in January, the country’s Europe minister resigns. Tax heaven Luxembourg has been once again reprimanded by the Commission for delays in transposing European anti-money laundering rules into its legislation. Our Special Reports this week look at the ongoing reform of Europe’s electricity market and how the EU’s circular economy strategy can help secure Europe’s supply of critical raw materials in a sustainable way. The digitisation of the agricultural sector will be at the heart of Greece’s growth following the exit from austerity-driven bailouts, says Greek minister Nikos Pappas. It is Strasbourg week and everyone awaits German Chancellor Angela Merkel’s speech on the Future of Europe scheduled for tomorrow morning in the Plenary Session. Today her shaky Berlin grand coalition faced another shake-up as German Interior Minister Horst Seehofer announced to imitate Angela Merkel.